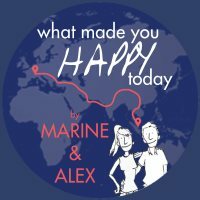 Dubai – April 16th to May 4th 2017 – What Made You Happy Today? When in Dubai, we decided to have another confirmation of this. But when we arrived at the Iranian Consulate, the officer told us we need the visa in advance to enter Iran by boat! We insisted that he checks again and again. And finally after a few calls, he gave us the good news: there was a new office in the harbour of Bandar Abbas that could make visa on arrival. So we run to the ferry company to buy our tickets to Iran. But there, the shipping company told us they needed the visa to issue the ticket. We told them about the new office in Bandar Abbas that issued the visas, but they didn’t believe us. We moved heaven and earth to make them get the information that we didn’t need the visa. We spent hours on the phone with them. 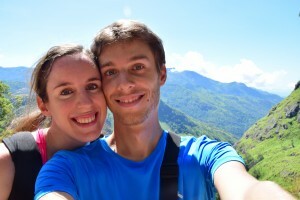 We were convinced that when they checked they would always rely on the fact it had never been possible before to get the visa on arrival so they wouldn’t check at the very source at the immigration office in the port. The length of our stay in Dubai was inversely proportional to the pleasure we had in this city! Dubai was the temple of consumerism and we were so far away from this state of mind… Good for us, we stayed in the Pakistani district and had a good time there creating relationships with the waiters of our favorite restaurants and the cashier at our Pakistani supermarket. During all that time, we worked hard on our projects. By chance we were there when the Arabian Travel Market exhibition was held. So we spent three days attending conferences and meeting tourism offices. A good way to immerse ourselves in the world of tourism which is linked to one of our projects! To make our stay a bit more exciting, we had the “opportunity” to live a power failure in Dubai Mall. Dubai Mall is the biggest shopping mall of the world. The place where consumerism reaches its highest point. Well imagine suddenly the lights and luminous promotions giving way to darkness… for two hours! People remained calm and we had to finish our meal under the candles. Funny experience in a country that sits on so much oil to have a power failure as we had in the middle of Pakistan! Finally our visits to the Iranian consulate lead us to a nice encounter. As we were coming back from the consulate, we asked a waiter in a restaurant about where to find the bus stop to come back to our Pakistani area. Alex was wearing his Omani dress which is similar to the dress of Emirati people except for a few details. After we walked a few meters, the waiter called us to come back. Actually a customer of the restaurant had seen us and wanted to know why Alex was wearing an Omani dress! The man invited us to eat with him and we started to talk about lots of subjects, politics, religion, happiness. He told us that what made him happy in his life is having his children! After our lunch, he wanted to show us around so he drove us to the beach. We left each other quite quickly as he had to fetch his children from school and we didn’t exchange any contact number. But it was the kind of incredible encounter that you remember as much as it’s ephemeral. When you read our next post, it will be in Iran. Inch’Allah. Pingback: Bandar Abbas – May 5th 2017 – What Made You Happy Today? Une panne de courant en plein Dubai? Woow! Ca doit être presque irréel! Pouur y avoir passé 2 mois, ce que j’ai preféré c’était vraiment le vieux Dubai, c’est tellement différent du clinquant du reste de la ville! 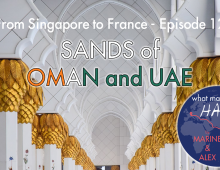 Est-ce que vous avez fait une escapade à Abu Dhabi? Oui franchement c’était très surprenant d’être plongés dans le noir d’un seul coup, on s’est même demandé si c’était pas le casse du siècle ! Et en effet le vieux Dubai était complètement différent du reste et nous ne nous attendions pas à retrouver autant de pakistanais ! 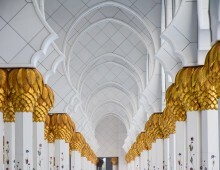 On est passés par Abu Dhabi avant d’aller à Dubai, juste quelques jours pour voir la grande mosquée et visiter Masdar City. J’imagine qu’il y a des endroits plus naturels aux EAU, tu as un peu visité plus loin des grandes villes ?